Recently, we have discussed Web-based versions of Word and Excel available in Office Web Apps. 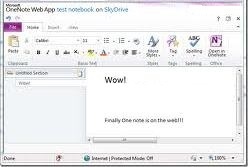 Today, we are going to describe the other two modules of online office suite from Microsoft, namely a PowerPoint presentation editor and OneNote, an application for managing notes. The basic method for creating a presentation is the same as with creating a text document or spreadsheet. Sign in to your SkyDrive account and click on the Create button in the upper left corner. Then select PowerPoint Presentation command. PPTX is the only available format. Similar to Google Drive or a desktop PowerPoint, the first step is to select a slide theme (template) and click the Apply button. There are 21 templates to choose from, each in four different colors. In total, we have more than 80 types of graphic background. Once this is done, you will be presented with a blank title slide, where you can easily add title and subtitle. If you have ever worked with desktop versions of PowerPoint, you will find working within the interface of the PowerPoint Web App as easy as pie. It offers access to most of the important features. The Ribbon-style interface provides six tabs. The first one, called Home includes a standard commands Copy and Paste. Here, we can also modify the font, draw AutoShapes and determine the flow of the text. The aforementioned ribbon can also be used to add new slides. It is accompanied by a new slide dialog box where you can select a slide layout. The most common layout is Title and content. It allows you to add a title and a large amount of text underneath. The second ribbon is Insert. Here, too, you can add new slides, together with AutoShapes, images from the hard drive and clipart. One of the most interesting things is SmartArt menu. It helps you create various types of graphical objects and gives the ability to divide them into categories, perform different processes or cycles. Designing is another component of the main menu. It allows us to modify the selected part of the presentation, change its style and color scheme. With Animations tab and Transitions we can apply different effects that we want to see while viewing the presentation. From the View tab, you can select the display mode as Editing View, Reading View, Slide Show, or Notes. Next to ribbons, we can find two other instructions. Open in PowerPoint option lets you quickly switch to desktop version ( works only if you have traditional Office installed). The second thing is Sharing – it does the same task as in online Word or Excel. Looking at the work area, you will notice a slide bar with thumbnails of all presentation slides, next to the active slide. It allows you to quickly find the interesting components and modify its order. Right-clicking on the slide opens a menu with basic commands. Using OneNote notebook is no different from other modules. After accessing SkyDrive select the Create / Notes. Choose a name and wait a while for the editor to load. Our notes are divided into so-called sections. We can create pages within those sections. Each page stores specific text. We have three ribbons at our disposal, which include basic commands for text formatting, copying, and pasting, as well as adding tags. Tags allow you to add notes at any place you wish, redlining, apply symbols and reminders. Insert menu is responsible for creating new sections and pages, as well as adding tables to the text, images, clip art, and hyperlinks. View - as in other modules - allows you to use the reading mode, and go through the list of authors and history. By clicking on the button next to the ribbons, we can open a desktop notebook in OneNote. Unfortunately, Microsoft does not allow us to share the content stored in the application. Looking at the Create menu in the SkyDrive’s interface, we can find another option - Excel survey. It is an equivalent of Google Docs Forms. It lets you easily create spreadsheets in XLSX format with questions and suggested answers. And on top of this, when you create a survey in Web Excel, the service automatically generates a table to store all of your results. So we can quickly make sense of data. I’ve only just scratched the surface with what these components can do, but PowerPoint Web App made a very good impression on me. The application offers quite a lot of functions, and a set of templates to create nice, versatile presentations adjusted to the specific theme and audience. OneNote works pretty well, although it cannot compete with other online solutions, such as Evernote. The interface is clear, but lacks advanced sharing options, as well as options for collecting and cataloging information. This application needs some improvement.